The major developments in the field of fluid and solid mechanics are scattered throughout an array of scientific journals, making it often difficult to find what the real advances are, especially for a researcher new to the field. The Advances in Applied Mechanics book series draws together the recent significant advances in various topics in applied mechanics. 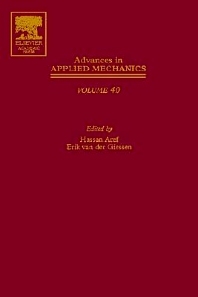 Published since 1948, Advances in Applied Mechanics aims to provide authoritative review articles on topics in the mechanical sciences, primarily of interest to scientists and engineers working in the various branches of mechanics, but also of interest to the many who use the results of investigation in mechanics and various application areas. Advances in Applied Mechanics continues to be a publication of high impact. Review articles are provided by leading scientists in the field on an invitation only basis. Many of the articles published have become classics within their fields. Scientists and engineers working in mechanics; university librarians.